Relatives of suspect in the Bolotnaya Square case Alexander Dolmatov, who committed suicide, demanded the queen of the Netherlands to conduct more thorough probe into his death. Likewise, Russian Foreign Minister Sergei Lavrov calls for finding out true causes of Dolmatov's suicide. Relatives of suspect in the Bolotnaya Square case Alexander Dolmatov, who committed suicide, demanded the queen of the Netherlands to conduct more thorough probe into his death. The mother of the opposition activist, Lyudmila Dolmatova, suspects that her son was driven to suicide, said Alexander Averin the spokesperson for unregistered opposition party "Other Russia." "Lyudmila Nikolaevna asks to conduct thorough investigation," Averin said. "There are suspicions that he was forced to commit suicide, or something worse may have happened. Alexander wasn't suicidal. One month before his death he was cheerful and brisk." Meanwhile, Russian Foreign Minister Sergei Lavrov calls for finding out true causes of Dolmatov's suicide. Russia wants to learn the truth about the incident, he told Interfax. One protester involved in the May 2012 case of civil disturbances on Moscow's Bolotnaya Square, Alexander Dolmatov, has committed suicide at a refugee center in the Netherlands. The day before, the Dutch authorities denied him political asylum and were preparing to deport him back to Russia, where he would have had to face criminal charges. Russian protesters have already blamed Amsterdam for his death and have set up pickets at the Dutch Embassy in Moscow. The Netherlands, however, denies the suicide was in any way prompted by the refusal to grant Dolmatov asylum. The demise of Dolmatov, a member of the unofficial opposition party The Other Russia, became public knowledge in Russia through the head of the international refugee rights network United, Girt Eyts. According to media reports, Girt Eyts called Evgeny Arkhipov, head of the Association of Russian Lawyers for Human Rights, to inform him that the opposition activist who had asked for political asylum in the Netherlands this summer had committed suicide at a refugee center in Rotterdam. “I am not aware of the cause or any other details,” Arkhipov said. Dolmatov, a chief engineer at a Russian defense company, left Russia in July 2012, after taking part in the May 6 March of Millions – an opposition protest held on the eve of the inauguration of President-elect Vladimir Putin. The march ended in clashes with the police. The investigative committee classed the event as a mass riot and as many as 20 protesters were detained. 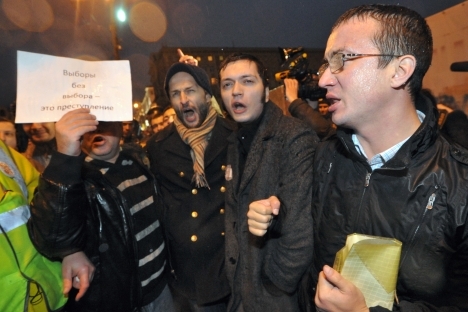 Dolmatov was hardly the only protester who fled Russia as the Bolotnaya case got underway. Linguist and gay activist Alexei Kiselev has applied for political asylum in Spain. Anastasia Rybachenko, an activist of the democratic movement Solidarity, has sought political asylum in Estonia, and her colleague Mikhail Maglov has applied to the United Nations High Commission for Refugees in Kiev. Furthermore, two more members of The Other Russia party headed for Ukraine: Jenny Curpen and Alexei Devyatkin. In an interview with Kommersant, press secretary of The Other Russia party, Alexander Averin, quoted Dolmatov as saying that he did not restrain himself on Bolotnaya Square and had used force to resist the police. After his home was searched, Dolmatov decided to leave Russia and applied for political asylum in the Netherlands. The Immigration and Naturalization Service of the Ministry of Security and Justice in the Netherlands refused to explain why Dolmatov had been denied political asylum. Meanwhile, a source in the Dutch organization handling refugee rights told Gazeta.ruthat it had recently become very difficult for Russians to obtain refugee status. “It is assumed [in the Netherlands] that Russia is moving toward democracy, because it now has an opposition, coalitions, etc. There is also another reason: with the right-wing government in power, they are countering immigration – including refugees,” the source said. After Dolmatov was denied asylum, he was transferred to the so-called immigration prison. “The conditions in the prison are decent, but the people are entirely cut off from the outside world. Recently, there has been an increase in the number of suicides there, although the actual figures are not all that high,” the source told Gazeta.ru. It is also known that Dolmatov had succeeded in lodging an appeal against the decision and that the hearing was due shortly. Gazeta.ruquoted Dolmatov's friend Denis Solopov (who had been granted political asylum in the Netherlands) as saying that Dolmatov's mother had difficulties contacting her runaway son in the days preceding the suicide. “Yesterday evening, he sent a text message from an unknown telephone number saying he was in a deportation prison at Rotterdam airport, and later it became known that Alexander had committed suicide,” Solopov said. Furthermore, Solopov insists that the immigration authorities in the Netherlands were reportedly interested in Dolmatov's knowledge of Russian military technologies. “He complained to me that, during his interviews, officials and law enforcers had appeared too interested in the details of his work. Alexander said he did not disclose anything; but, since he was convinced that the Federal Security Service would not believe him and would class him as a traitor, he still feared deportation,” Solopov said. According to Gazeta.ru, Dolmatov had class-three security clearance, i.e., access to one of the lowest levels of official secrets. Dolmatov's lawyers and friends recently found out that the dissident had been depressed and had attempted suicide at least twice in the last five days. The Dutch branch of Amnesty International reported that they were preparing a statement for the local authorities about the death of the Russian dissident, without revealing the content of the actual message. Dolmatov's fellow opposition activists set up pickets at the Netherlands Embassy in Moscow and the Netherlands Consulate in St. Petersburg. A similar protest had been planned in Kiev, also. The Netherlands has refused to acknowledge that Dolmatov's suicide was in any way connected to the refusal to grant him political asylum. Onno Elderenbosch, deputy head of the Dutch Embassy in Russia, said a letter from Dolmatov’s mother was found on the dissident, indicating that the suicide was not prompted by the refusal to grant asylum. RBC reported that Elderenbosch refused, however, to disclose any details of the letter, on the grounds that it was a private matter. This article is based on materials from Kommersant, Gazeta.ru, Vzglyad, Interfax and RBC Daily.